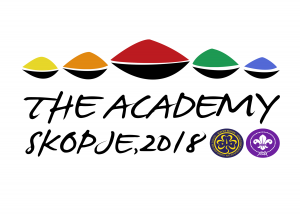 The Academy 2018 is a unique Scout and Guide event designed to enable participants to get high quality training and networking opportunities around the core priorities of the European Regions of WAGGGS and WOSM. The event is open to anyone holding a role at national level in a WAGGGS or WOSM Association, ranging from members of working groups up to Chief Commissioners. Most Associations are likely to send participants that hold positions in specific areas of work including management (as Commissioners or board members), education or training (those responsible for programme/education/training), communication or representation (for instance in branding or advocacy). More information can be found in the invitation letter and online registration will be available from 1st August 2018. The 2018 Academy will be held from 30 October to 4 November in Skopje, Former Yugoslav Republic of Macedonia. More information about the venue and Skopje can be found here. The information contained in this website is for general information purposes only. The information is provided by The Academy Support Team and while we endeavour to keep the information up to date and correct, we make no representations or warranties of any kind, express or implied, about the completeness, accuracy, reliability, suitability or availability with respect to the website or the information contained on the website for any purpose. Any reliance you place on such information is therefore strictly at your own risk. Through this website you are able to link to other websites which are not under the control of The Academy 2018. We have no control over the nature, content and availability of those sites. The inclusion of any links does not necessarily imply a recommendation or endorse the views expressed within them.